On April 7, 2016, the Supreme Court of Wisconsin issued its opinion in In re Marriage of Meister, 2016 WI 22, 876, N.W.2d 746, reversing an unpublished court of appeals’ decision affirming a circuit court order denying a grandmother’s motion for visitation rights. The case required the Wisconsin Supreme Court to interpret Wis. Stat. section 767.43(1), which allows certain categories of individuals to petition for the right to visit children, usually following the dissolution of a marriage. Under the statute, a grandparent, great-grandparent, stepparent, or person who has maintained a relationship similar to a parent-child relationship with the child may file a motion for visitation rights. The Wisconsin Supreme Court had to determine whether the parent-child relationship requirement applied only to the person category listed in the statute or whether it applied to a grandparent, great-grandparent, and stepparent as well. The case arose after Carol Meister filed a motion for the right to visit her four grandchildren in the wake of her son Jay Meister’s divorce from Nancy Meister. The family court commissioner for the Jefferson County Circuit Court initially granted the motion, but the circuit court denied the motion on de novo review. Reading section 767.43(1) as requiring every petitioner under this subsection to demonstrate a parent-child relationship with the child, the circuit court concluded that Carol’s supportive relationship with the children did not elevate her to a parent-like role in their lives. The Meister children appealed, and the court of appeals affirmed, citing its decision in Rogers v. Rogers, 2007 WI App 50, 300 Wis. 2d 532, 731 N.W.2d 347, as controlling. In Rogers, the court of appeals held that grandparents filing a motion under section 767.43(1) must prove a parent-like relationship with the child in order to secure visitation rights. The Meister children, through their guardian ad litem, filed a petition for review, which the Wisconsin Supreme Court granted. The Meister children argued that the court of appeals misinterpreted section 767.43(1) in Rogers. They asserted that the phrase “who has maintained a relationship similar to a parent-child relationship with the child” applies only to a person other than a grandparent, great-grandparent, or stepparent filing a motion for visitation under the subsection. Nancy countered that reading the subsection to allow courts to grant visitation rights to grandparents, great-grandparents, and stepparents based solely on a best interest of the child determination would intrude on parents’ fundamental due process rights to direct the care, custody, and control of their children. 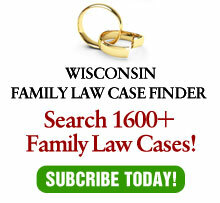 In examining “the syntax” of section 767.43(1), the Wisconsin Supreme Court found it was clear that the legislature had gradually expanded the number of persons who may petition for visitation rights. The current statute allows grandparents, great-grandparents, and stepparents to petition for visitation rights, and it allows other persons to seek visitation as well, so long as they have “maintained a relationship similar to a parent-child relationship with the child.” Given the legislature’s history of expanding visitation rights and the fact that any court considering a child’s best interests under section 767.43(1) must give special weight to fit parents’ best interest determinations, the Wisconsin Supreme Court concluded that a grandparent, great-grandparent, or stepparent need not prove a parent-child relationship in order to secure visitation rights under that subsection. Importantly, the Wisconsin court further held that this interpretation of the statute would not violate the constitutional rights of fit parents to raise their children under Troxel v. Granville, 530 U.S. 57 (2000). The court apparently believed that since visitation could only be granted when a court found it to be in the best interests of the child, the statute, as interpreted, was constitutional. This decision may very well greatly expand grandparent visitation litigation in Wisconsin. As a result, the court may have missed the forest due to trees. The “trees” is the statutory provisions that it painstakingly analyzed correctly. The “forest,” to which they give short shrift (and not for the first time), is the need to protect children from litigation. The court spends 23 pages of its decision dissecting the statute. It spent just a bit more than three pages discussing the application of Troxel. While the court concluded that the court of appeals “appropriately addressed” the constitutionally protected liberty interests of parents in Roger D.H. v. Virginia O., 2002 WI App 35, 250 Wis. 2d 747, 641 N.W.2d 440, it does not even discuss the concept that litigation is inherently bad for children. Therefore, any law that encourages litigation over children is detrimental to them. The constitutional rights of fit parents to be free of court supervision finds support long before Troxel (and in Troxel). Consider, for example, a situation where there are two sets of grandparents, both sets of which are divorced and remarried and all four sets want court-ordered time with the grandchildren. Beside the litigation and the cost (which should be enough to discourage such an event in and of itself), imagine if they were successful. There may never be a weekend left for an intact family. A likely event? Perhaps not. But the Wisconsin Supreme Court seems to think that children will be protected by trial courts basing their rulings on children’s best interests. The problem is that by the time the court gets to that decision, the harm will be have done by the litigation itself. This is not a unique position by this court. On issues such as prohibiting contingent placement orders and refusing to honor stipulations freezing child support, the court fails to see the harm to children created by litigation itself. That is unfortunate, as frequently the best interests of children are best served not by money, but by peace. Grandparent visitation issues frequently comprise the rare legal case where both sides are right and neither are wrong. One’s heart goes out to grandparents who are being deprived of the right to see their grandchildren, especially in a case like Troxel where the parent of the child has died. Yet, the decision should be based on the best interests of the child with all other interests and rights being subordinate. And that interest is usually better served by lack of litigation than by resolving convoluted statutory language.